With over thirty years experience in Qigong, Tai Chi & Wing Chun Kung Fu, Adam Wallace teaches traditional Wild Goose Qigong, Chen Style Taijiquan (Tai Chi), Wing Chun Kungfu, and Chun Yuen Quan. in the East Bay Area of San Francisco. Adam was born in London, UK, in 1966. Went to school in Weybridge, Surrey, and obtained his Black Belt in 1988 (Shodan rank) from the British Karate Association under Sensei John Hayes (retired). 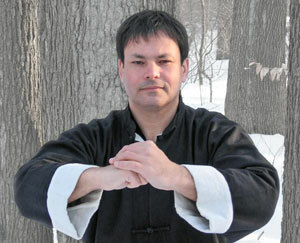 He began studies with Sifu (Master) Michael Tse in 1988 which included Hard Qigong. Adam Wallace is a certified senior instructor of the Tse Qigong Centre. He moved to New York City in 1992, and taught in the New York and New Jersey area for 18 years. He relocated to California in 2013. Adam has also studied with his Grand-teachers Chen Xiaowang, 19th generation lineage holder, Chen Family Taijiquan and Ip Chun, (eldest son of legendary Ip Man), teacher of Wing Chun Kungfu. He has also been published in Qi: The Journal of Traditional Eastern Health and Fitness (also known as Qi Journal), Journal of Asian Martial Arts, The Empty Vessel: A Journal of Contemporary Taoism, Kungfu/ Tai Chi, Inside Kungfu, and Black Belt. Adam Wallace Chinese Health & Martial Arts: Lineage and Tradition. YouTube. Wild Goose Qigong ... YouTube. Chen Style Qigong ... YouTube. Web Page: Adam Wallace Chinese Health and Martial Arts.